London: Michael Joseph LTD, 1988. This is the uncorrected proof copy of the paperback edition of Skinwalkers. This edition was published by Michael Joseph Limited in London, England. 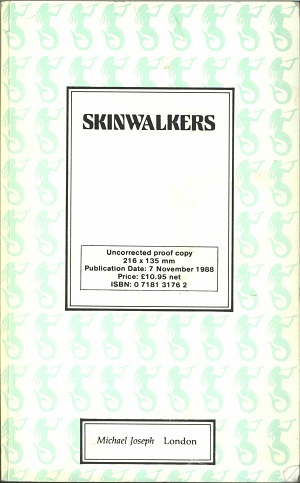 This copy was printed in 1988 for review before the final version of Skinwalkers was published in London, England. The cover for this uncorrected proof which contains the publishing information about this uncorrected proof including: price, ISBN, estimated publishing date, and the size of the proof. The image of the publisher's logo is repeated around the publishers information in a sea foam green color. Format: Paperback, 21.5 x 13.4 cm. Binding: Full-colored paper covers with the publisher's information printed on the cover.